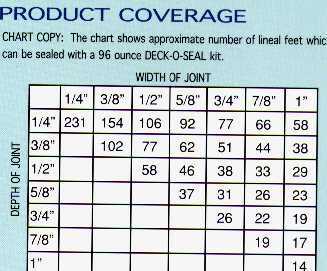 Parrish Pools USA - Deck-O-Seal Coverage Chart - Click Here. The chart shows approximate number of lineal feet which can be sealed with a 96 ounce DECK-O-SEAL kit. Depth 1/4" 3/8" 1/2" 5/8" 3/4" 7/8" 1"